Feast your eyes on these gorgeous holiday projects. From gifts to favours, and from home decor to festive ornaments, these projects feature a fresh, seasonal colour palette and lots of glittery sparkle. 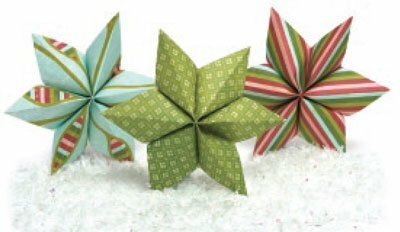 Apply a thin layer of clear glue to the rim of a metal ornament; lay on top of patterned paper; let dry; cut out with an Exacto knife. Repeat with other ornaments and photos if desired. Punch a small hole near the top of the paper/photo; thread ribbon through hole; attach beads if desired and knot. 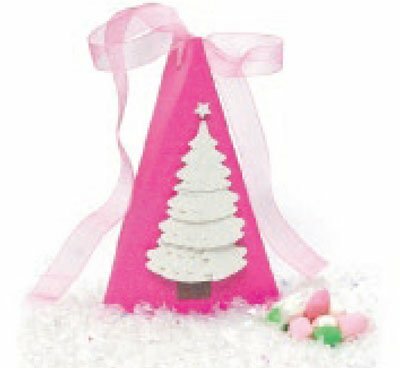 Hang on tree or attach to presents as a festive gift-topper. Measure tin on both the inside and the outside (inside will be slightly smaller). Cut paper to size (approx. .25 of an inch smaller on all sides). Round corners; adhere paper to tin using double sided tape. 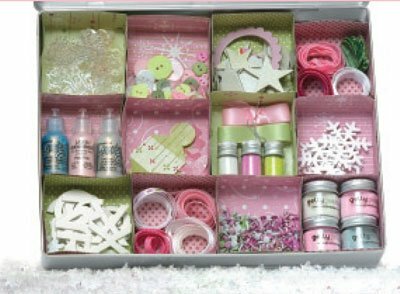 Attach embellishments; fill tin with goodies of choice. Measure the outside of the tin. Cut paper to size (approximately .25 of an inch smaller on all sides). Measure the width, length and height of the inside base of the tin. the base of your squares. 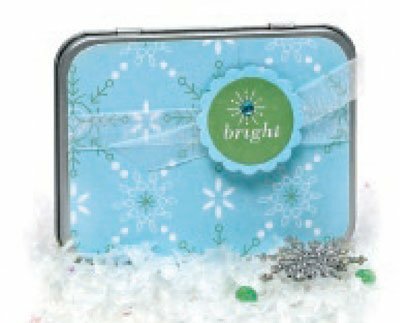 Add slightly less than 2 times the height of the tin to both the width and the length of each square and cut 12 squares in a variety of patterned papers. Score each box using the measurements calculated above. squares that have formed on each corner. Fold up box and adhere flaps to the side of the box. Fold a piece of 4 x 12 cardstock in half; open and lay flat. to each other to form the triangle box. Glue tag face embellishments on front. Punch hole at top for ribbon. Paint front, back, and sides of birdhouse (including snowflakes) a bright raspberry and let dry. Tape off pink areas of birdhouse. Paint roof and base green and let dry. Trace shingles using tracing paper; cut out. 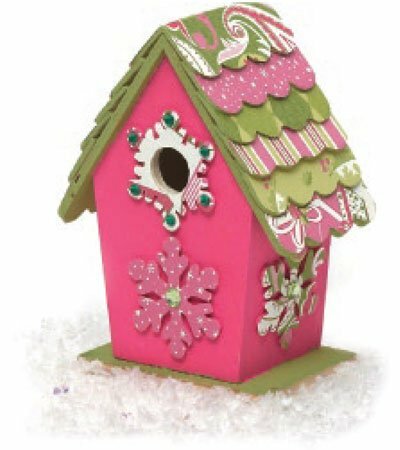 Use as templates to cut patterned papers; adhere patterned paper to shingles on birdhouse. 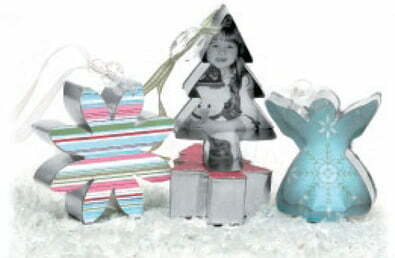 Trace snowflakes onto patterned paper; cut out; adhere snowflakes on birdhouse; adhere rhinestones to snowflakes. Apply several thin coats of decoupage over completed birdhouse. Lay out patterned paper in desired order before cutting. Cut twelve 4 x 4 squares; use 3 different colours. Adhere squares onto a 12 x 12 piece of cardboard in a pleasing checkerboard pattern. Group your themed embellishments on each square. Use foam dots to layer the embellishments. Use Velcro and attach the storyboard to the canvas (this makes it easier to change out future storyboards). Attach a wide sash ribbon at the top. 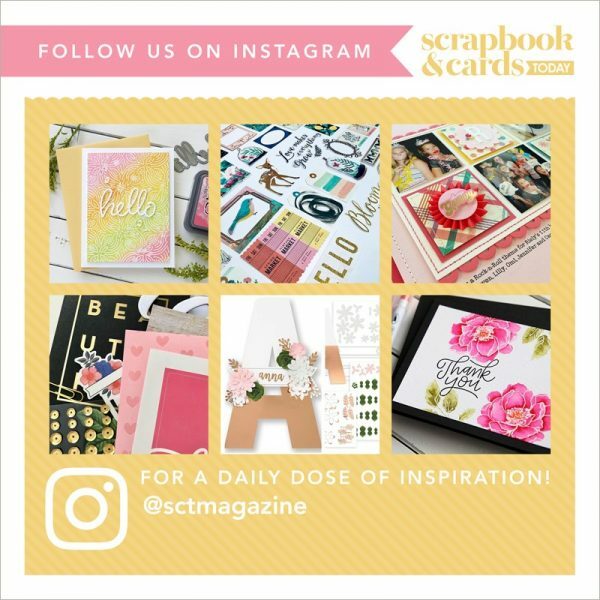 After you have displayed your storyboard, you can easily detach it from the canvas and keep it in your scrapbook!